Mon, Oct 22, 2018, 09:36 pm SL Time, ColomboPage News Desk, Sri Lanka. Oct 22, Colombo: President Maithripala Sirisena made a financial donation of Rs. 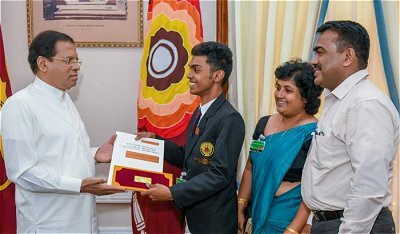 one million to student Gihan Hettiarachchi of Gampaha Bandaranaike College, who made a rocket that can travel up to 20 kilometers, for his future innovation works, at the Presidential Secretariat, today (22). The rocket developed by student Gihan Hettiarachchi captured the attention of President Maithripala Sirisena when he attended the school's Centenary Celebrations as the Chief Guest and opened the X-Ban Exhibition held to showcase student talents on October 13. During this event the President appreciated the talents of the student and promised to provide necessary financial assistance to do the further developments to the rocket to launch it. Also, the President summoned the technical officers of the Sri Lanka Air Force and instructed them to provide necessary assistance to the student to launch the rocket.